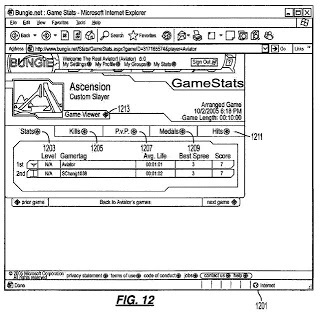 The ‘916 patent describes a computing network where, while one or more players play online, computer-readable media storage units collect telemetry data while the game is being played. The units then analyze this data and view location information of players throughout the game. Once the game is complete, all of the different player’s data is combined into one file to reduce redundancy. One reason behind this telemetry data collection is so that less skilled players can be matched up with more advanced players and thus will be afforded the opportunity to research the more experienced tactics. The telemetry data also collects stats throughout the game. For example, in Halo 2, the killer and the victim are recorded throughout the game and a running total of both a team score and an individual’s kill count are kept. Finally, the telemetry data is collected in order to identify and punish cheaters. Whenever a person is deemed a cheater they are effectively barred from logging back into the game. Methods and systems for recording and analyzing game session telemetry data are disclosed. A game console records telemetry data during a game session of a video game. The telemetry data may include location and time information for a player character performing various events in the video game. The telemetry data is sent to a title server corresponding to the video game, and the title server analyzes the data and stores the data in a database. A user, via a web site, can subsequently query the telemetry data stored in the database for user-specified criteria. A two-dimensional image of a view of the simulated environment within the video game is generated, overlaid with the location and time-based telemetry data, and is sent to the user for review and analysis.